I-787 is a spur serving downtown Albany and connecting Albany with Troy via NY 7. It officially runs from the Thruway to Troy over the Collar City Bridge (and was originally planned to end at a US 4 freeway in Troy); however, it is signed over reference route 912S to US 9W, its planned connection with the original I-87 alignment parallel to the Thruway. The I-87 plans were cancelled and it was placed on the Thruway, leaving the odd ramps at Thruway exit 23 and a Northway stub as the only indications of the old plans. 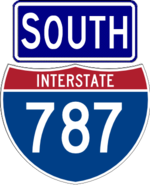 Signage for I-787 is truncated to NY 7/NY 787 to avoid confusion, however southbound signs for I-787 exist on the Collar City bridge, which was to be part of I-88 before being assigned as NY 7. The City of Albany is studying how to improve access to the waterfront, with one proposal including rebuilding I-787 as an at-grade boulevard. 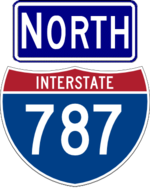 NY 787 extends I-787 to Cohoes, and plans intended for it to continue into Waterford using the bed of the Champlain Canal. Interstate designation officially follows ramp. Bennington I-787 officially exits here and ends across the river in Troy, but is not signed as such.